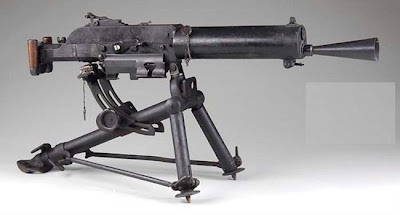 Schwarzlose MG M.07/12The Maschinengewehr Patent Schwarzlose M.07/12 (Known as the O' seven twelve) was a medium machine-gun, and was used as a standard issue firearm in the Austro-Hungarian Army throughout World War I. It was also used by the Dutch, Greek and Hungarian armies during World War II. It was also routinely issued to Italian colonial troops, alongside the Steyr-Mannlicher M1895 rifle. The Schwarzlose M.07 was a water-cooled, belt-fed weapon designed by a German named Andreas Wilhelm Schwarzlose. 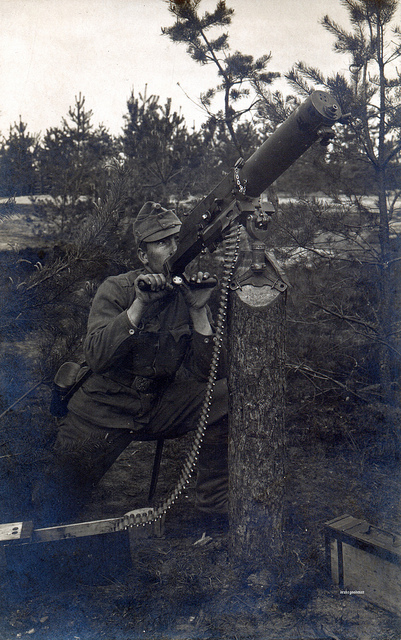 It was usually mounted on a tripod and looked broadly similar to the family of Maxim-derived machine-guns such as the British Vickers and the German Maschinengewehr 08. 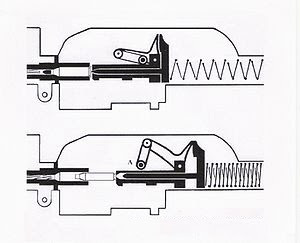 The Schwarzlose, however, was of simpler design and featured an unusual, delayed blowback mechanism which contained only a single spring. 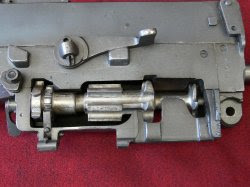 The initial variants of the M.07/12 had a cyclic rate of about 400 rounds/m, but this was later increased to 580 rounds/m during World War I by fitting the mechanism with a stronger spring. 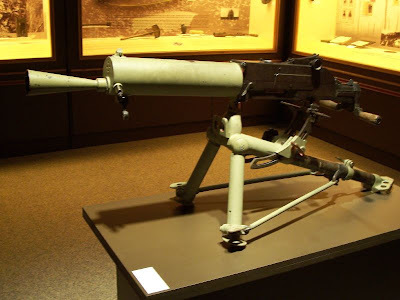 The Schwarzlose was a robust and reliable weapon in its intended role as an infantry weapon, but unlike the highly adaptable Maxim-derived machine guns, met with less success when it was used in roles it had not been designed for. The Schwarzlose enjoyed moderate export success in the years leading up to World War I. Apart from the armies of the Austro-Hungarian empire (8 mm caliber) it was adopted by the armies of Greece (6.5 mm caliber), the Netherlands (6.5 mm caliber) and Sweden (using the 6.5x55mm cartridge and designated kulspruta m/1914).After the First World War the Schwarzlose continued in use with the new nations that emerged from the fragments of the Austro-Hungarian empire. Captured examples of the Schwarzlose saw some sporadic use by Russian and Italian units during the First World War. 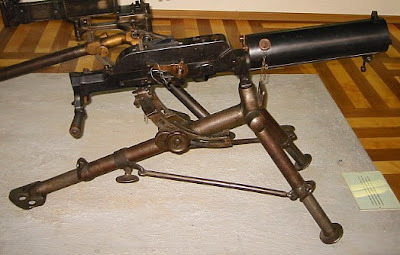 During World War II captured Schwarzlose machine guns of various types saw service with second line units of the Nazi German army, especially during the desperate fighting that took place in the final phases of that conflict. The Schwarzlose MG M.07 is a Toggle-delayed blowback, water-cooled machine gun. The mechanism incorporates a device that oils cartridge cases to ease extraction. After World War I the Schwarzlose equipped the armed forces of Czechoslovakia, where it was adapted (vz. 7/24) and manufactured (vz. 24) as the těžký kulomet vz. 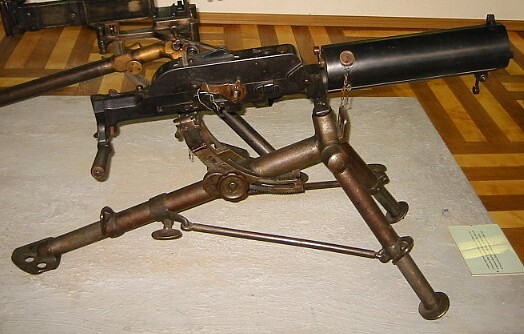 7/24 (heavy machine gun model 7/24) by the Janeček factory (adapted from 8 mm calibre to standard Czechoslovak munition 7,92 Mauser). 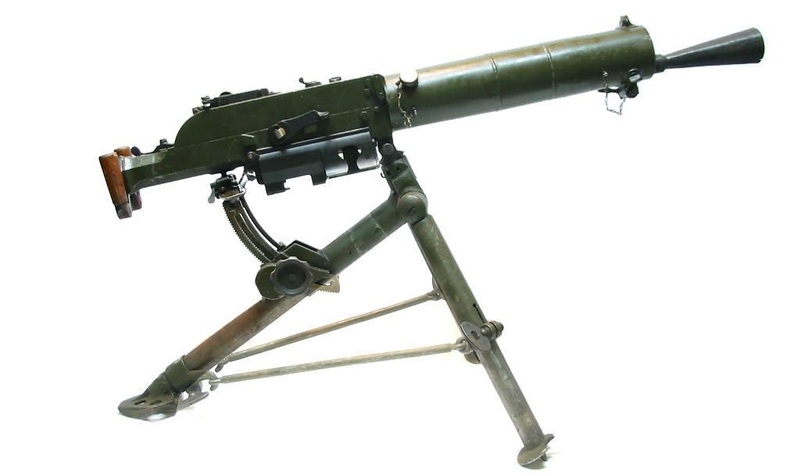 When Czechoslovakia started building fortifications against Nazi Germany in 1935-1938, light fortifications, known as types 36 and 37, were partially armed with the Schwarzlose vz. 7/24. 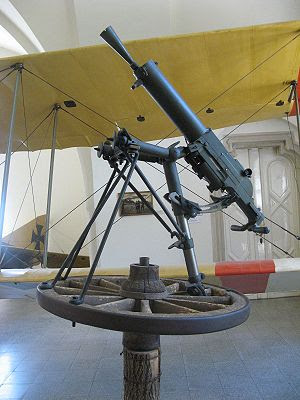 Apart from its use as a heavy infantry machine gun and as an anti-aircraft weapon, the Schwarzlose saw service with the Austro-Hungarian Luftfahrtruppe during World War I as an aircraft machine gun, a role for which it was not entirely suited. The Schwarzlose was used both as a fixed forward firing gun and as a flexible, ring mounted, defensive weapon. Synchronizing the Schwarzlose for use in fighters turned out to be a difficult engineering challenge. A critical factor in sychronization is the time delay between the trigger movement and the moment when the bullet leaves the barrel, as during this delay the propeller will continue to rotate, moving over an angle that also varies with engine rpm. Because of the relatively long delay time of the Schwarzlose M7/12, the synchronization systems that were developed could be operated safely only in a narrow band of engine rpm. Therefore the Austro-Hungarian fighters were equipped with large and prominent tachometers in the cockpit. The M16 version of the gun could be synchronized with greater accuracy, but a widened engine rpm restriction still had to be respected, except for aircraft equipped with Daimler synchronization gear. The result was never entirely satisfactory and Austro-Hungarian aircraft thus armed usually carried the Kravics indicator, an ingenious bullet strike sensor on the propeller, to warn the pilot of a malfunction in the synchronization mechanism.